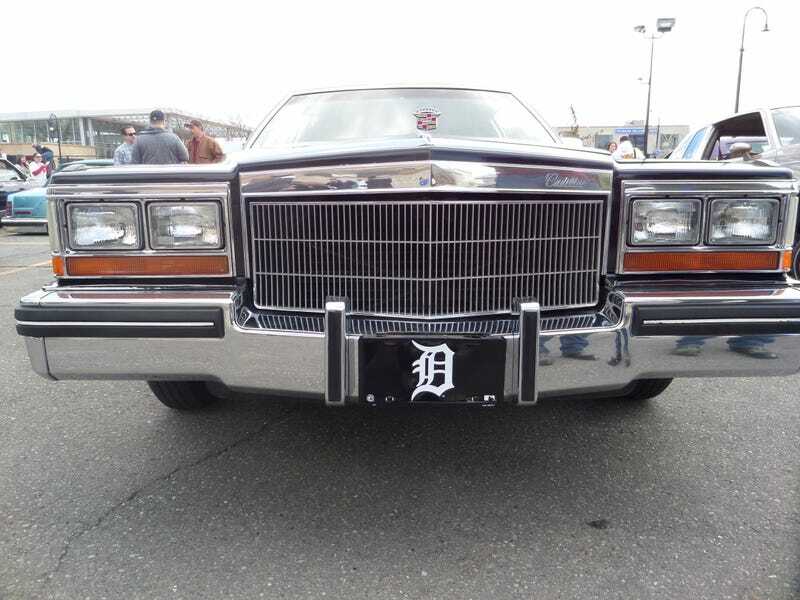 Every year during Cinco de Mayo, there's a tradition where men and women gather around Impalas, Regals, Caddys and other rides for "Blessing of the Lowriders," an only-in-Detroit event where steel, salvation and stereotype-breaking meet. Back in 1997, a group of teens wanted to start a car club. Specifically, a lowrider club. They all wanted to get together to wrench, to modify and to cruise. Simple as that. The problem is, if you're young and Latino and want to start a lowrider club in Southwest Detroit, you're automatically pegged as a gangbanger. Isn't it possible just to take a G-body GM and customize it without being stopped by the cops or sneered at by old ladies? When the budding car club started out, they sought out a mentor. They found one in Victor Villalobos, a Southwest resident who taught the boys how to ride and how to be respectful. For one, no sagging pants and backwards ball caps — probably a hefty demand in the late '90s. Keep your music low. Respect traffic laws. If you don't want to be seen as a gang, then don't act like a gang. Still, a few residents were worried about the lowriders. Again, this was the '90s — didn't the majority of people associate them with rap videos back then? Feeling ostracized, Villalobos took the boys — and their cars — to one place where they'd be accepted: Church. If you're familiar at all with Detroit, you should know about St. Anne — the formal name is Ste. Anne de Detroit Catholic Church. The church was established in 1701; its current structure, built in 1886, is one of the oldest buildings in the city. It's the second-oldest continuously operating Roman Catholic church in the country. Here's where the lowriders would get their first blessing. Villalobos and the club caught the congregation off guard, but their intent was pure: The boys needed a place where they wouldn't be judged. Indeed, Matthew 7:1 reads, "Judge not, lest ye be judged." Sure enough, the church welcomed the lowriders and the pastoral staff blessed their cars, leading to a new tradition. So every year after the Cinco de Mayo parade, where some of the lowriders are allowed to participate, they drive over to a lot in the shadow of St. Anne's steeples, where a priest says a prayer and sprinkles holy water on the hoods and trunks of each lowrider. The event has grown from a makeshift parking-lot church service to a full on car show, with food trucks selling tacos and dozens of admirers coming from across suburban borders. In true Detroit collaborative fashion, this year's Blessing was in the parking lot of 555 Gallery, a Southwest art gallery that shares space with Detroit Farm and Garden. So you can look at vintage photos of Palmer Woods, get a carne asada taco on a corn tortilla and some organic mulch for the backyard. And there were breakdancers this year, with members of the Motor City Rockers giving lessons to wannabes. Every year, Villalobos takes to the mic and tells the story of how the teens looked everywhere before they found a welcoming place in the church. Now, they're all grown up and are upstanding men in Southwest — owning businesses, raising families, mentoring other up-and-comers. "This is proof that lowriding is a positive influence," he told the crowd this year. For a few years, the Blessing was on hiatus until Young Nation, a community group led by Erk Paul Howard, asked Villalobos to take up the cause again. For the last five years, Young Nation has helped put on the Blessing. And the club has grown from beyond young Latino men; there are women and non-Latinos here to be blessed as well. "There is no place like Southwest," Villalobos says. It's true; Southwest Detroit is huge, but tight-knit. A young Lutheran priest, John Cummings from Grace in Action in Southwest, is doing this year's Blessing and speaks of the mission of Jesus and bringing people together for one common passion. Sadly, there was a shooting at the parade this year, and a moment of silence is held for the victim. It made the prayer that much more meaningful; "May your spirit rest upon these lowriders and their drivers and their rides, that they may travel safely and in peace." Special thanks to Erik Paul Howard and Young Nation!